Kurosaki Ichigo is an average high school student, except for the fact that he can see ghosts. 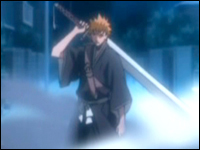 One day he sees two things other than ghosts, a Hollow, and Kuchiki Rukia, a soul reaper. After Rukia obtains an injury, Ichigo thursts her Zanpaktou (Soul Slayer) through his heart to gain her powers, become a soul reaper, and save his family.